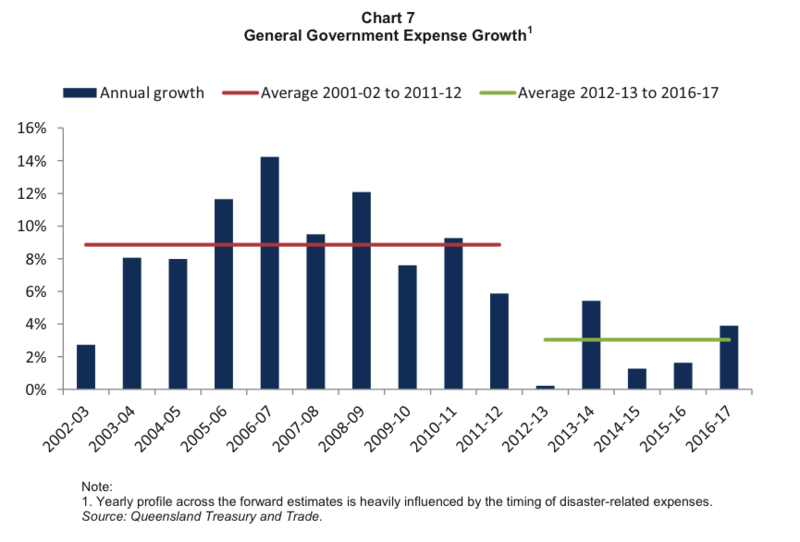 The Queensland Government’s Mid Year Fiscal and Economic Review released yesterday didn’t contain many surprises, but left me with the thought the Government will have plenty of room to boost spending in next year’s Budget, in preparation for an election in late 2014. Speculation about a poll in early 2014 has now passed, as there appears to be a recognition on George St – more-or-less acknowledged in the Mid Year Outlook – that the Government will need to work hard to convince the public of the need for asset sales to repair the Budget. The Government is giving itself enough time to mount the case for sales, which, all things considered, should be easy to do, given the need to fix the budget and the logical arguments in favour of private ownership (see e.g. my post Productivity Commission says no rationale for State ownership of Energex and Ergon). I expect the Government will have room to boost spending in next year’s Budget for a couple of reasons. Current budgeted expenditure growth over the forward estimates is very low (see Chart 7 from the Review that I’ve copied and pasted below), and the gross state product (GSP) growth forecast of 3% in 2014-15 is pretty conservative and I expect will be revised upwards in next year’s Budget, boosting the revenue the Government has to spend. As I’ve discussed previously, there are positive signs appearing for the Queensland economy (see e.g. Reasons to be optimistic Qld will cope with shock from mining investment decline). This entry was posted in Budget and tagged budget, election, myfer, qld, queensland. Bookmark the permalink.